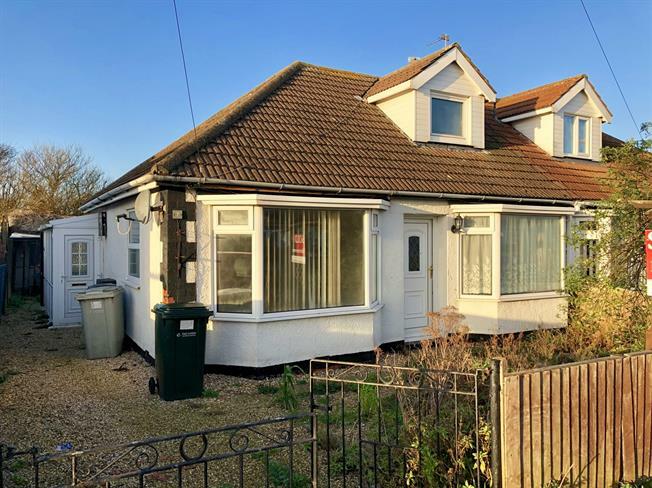 2 Bedroom Semi Detached Bungalow For Sale in Mablethorpe for Asking Price £115,000. Semi detached bungalow with lounge and kitchen, bathroom, sun room, ground floor bedroom and first floor room. Gardens front and rear, no onward chain. Double glazed door. Radiator, carpeted flooring. Double glazed bow window facing the front. Radiator, laminate flooring. Double glazed window facing the rear overlooking the garden. Laminate flooring. Roll edge work surface, wall and base units, single sink, space for fridge and freezer. Wall mounted boiler. Double glazed doors opening onto the garden and access to the front. Double glazed window surround. Laminate flooring. Double glazed window facing the rear overlooking the garden. Radiator, laminate flooring. Stairs to the first floor. Double glazed bow window facing the front. Radiator. Double glazed window with frosted glass. Radiator, built-in storage cupboard, part tiled walls. Low level WC, panelled bath, shower over bath, wash hand basin. Double glazed bay window facing the front. Radiator, carpeted flooring. Sloping ceilings. Low maintenance front garden, the rear garden has a concrete patio, decking, outbuilding and garden area.